A pelleted protein supplement for hand-feeding or mixing with grains for feeding to dairy cows, dairy heifers, dry dairy cows, beef cattle and/or goats. Plant protein products, processed grain byproducts, molasses products, calcium carbonate, monocalcium phosphate, dicalcium phosphate, magnesium sulfate, potassium sulfate, salt, zinc sulfate, ferrous sulfate, manganese sulfate, copper sulfate, ethylenediamine dihydriodide, cobalt carbonate, sodium selenite, vitamin A supplement, vitamin D3 supplement, vitamin E supplement. 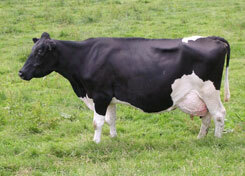 Lactating cows should be fed the final grain mixture at the rate of 1 lb. per 3 lbs. of milk produced. Growing calves should be fed 1.0 to 1.5 lbs. per 100 lbs. of bodyweight per day.